A cold rainy day again! there's so much rain lately. The light was low. There's no sun. The light was low. I decided to do some drawing with a hope that one day when the weather is right I can use it for a painting. The challenge of Italy kept me focus for good hours. I tried to keep the buildings and the paving in perspective. If the things were done right, I would feel the space and its grandeur. Practice with perspective is great fun! 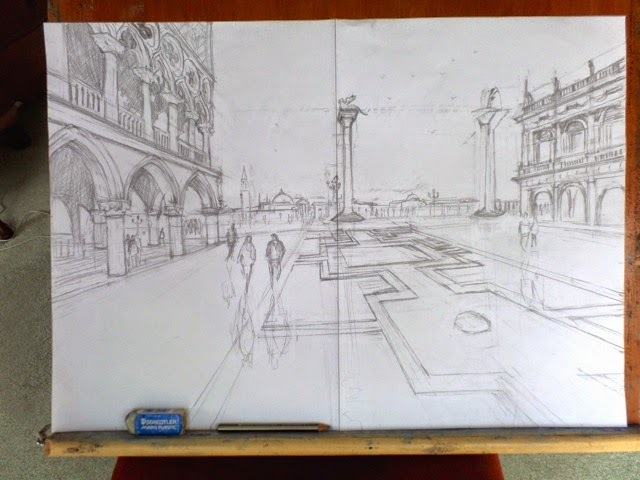 There're few details to be adjust to keep the tilling perfect, some shading at the smaller building.. but I think I leave it till the painting day! .. I love the characters of those buildings .. the reflective light of sky, buildings and people.. that's a lot! .. I know.. I will have to think hard how to get them painted the watercolour way!..